This space contains the latest information about work on the REM for the Deux-Montagnes and Mascouche lines (updated: February 2019). 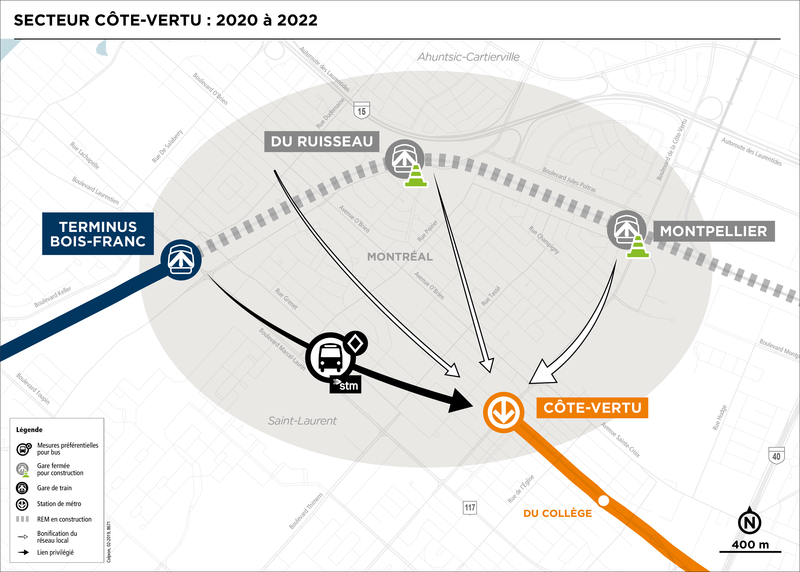 The REM will gradually replace the Deux-Montagnes line in 2022 and 2023. The work involves replacing the train with an automated light rail transit system. 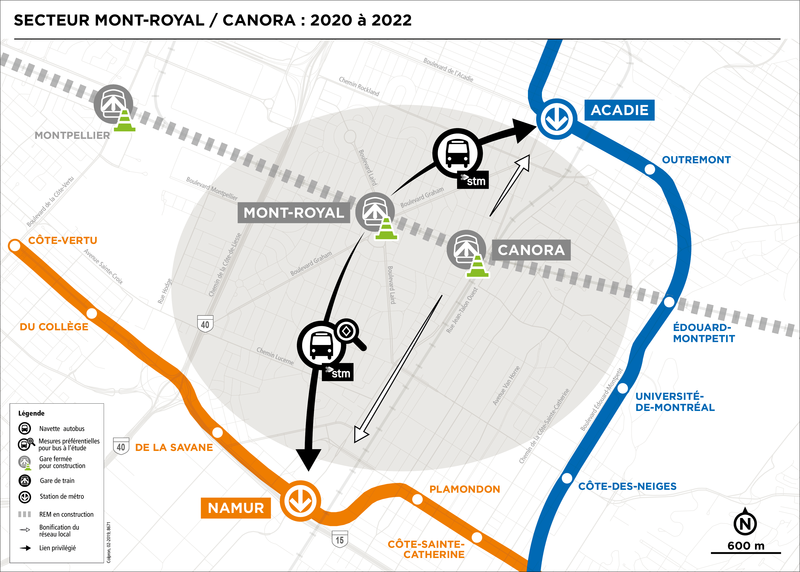 The tracks and power supply will be changed over 30 km, 12 enclosed stations will be built and 3 connections will be added to the McGill and Édouard-Montpetit stations and the Mascouche line. Existing infrastructure such as the tunnel under Mount Royal and the railway bridges will also be renovated and modernized. ⚠ In progress: Beginning of construction of McGill, Édouard-Montpetit, Canora and Mont-Royal stations and of the Saint-Eustache maintenance centre. There is currently no service on Friday nights and weekends on the Deux-Montagnes and Mascouche lines. The ARTM, Mobility Montréal and transit authorities are working together to set up a transitory network during the work period. Bus shuttles with preferential measures will be set up and local lines will be improved starting in January 2020 and mid-2021. Deux-Montagnes line: The transitional network provides service to the Côte-Vertu metro station (orange line). Many preferential measures for buses will be implemented (for example A640, A13, others are still under study): reserved lanes, priority traffic lights, coordinated schedule, high frequency. 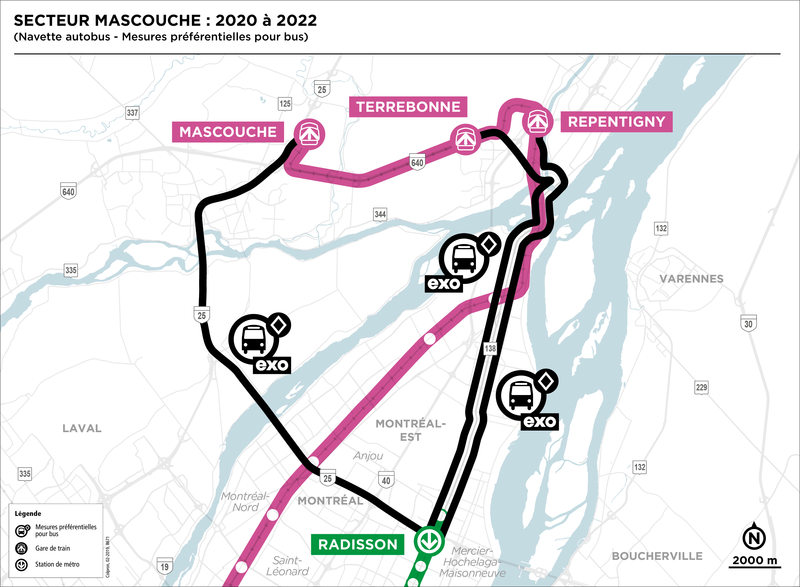 Mascouche line: The transitional network provides service to the Radisson metro station (green line) with the implementation of preferential measures for buses, for example on A25 and Route 138. These transitional measures are designed to bypass the East branch of the orange metro line (Montmorency–Berri-UQAM) in order to avoid overloading it. Note: bus schedules, stops and lines require a significant coordination between the transit organizations and will be definitive by the fall of 2019. What are the differences between REM and the Deux-Montagnes line train service? Departure frequency. The REM will operate 20 hours a day, 7 days a week, with departures every 2 min 30 during peak hours and every 5 min in off-peak hours between Gare Centrale and Bois-Franc. Between Bois-Franc and Deux-Montagnes, trains will depart every 5 min during peak hours and every 15 min in off-peak hours. Capacity. The capacity on the Deux-Montagnes line will increase significantly. For example, during morning peak hours between 6:00 a.m. and 9:00 a.m., the REM will serve 42,100 people (compared to 17,100 currently). New connections. 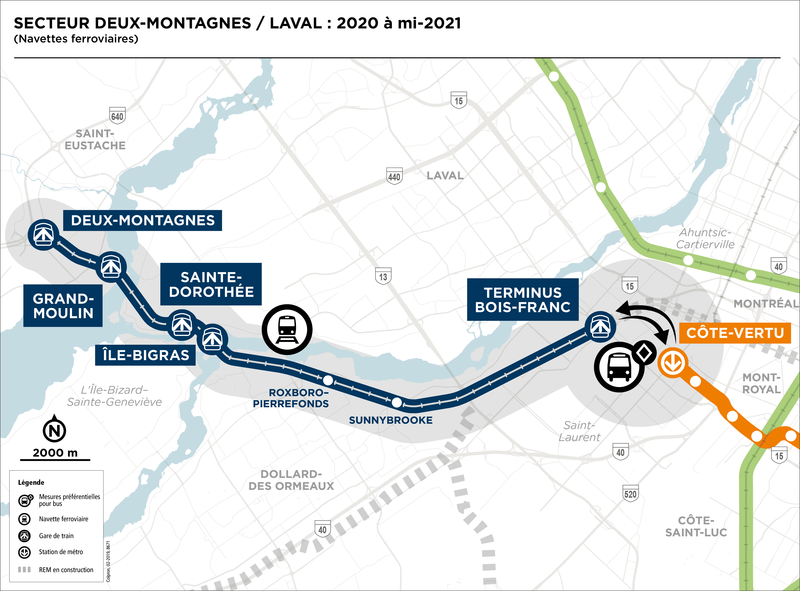 The REM will connect to Montréal’s three existing metro lines: blue (Édouard-Montpetit), green (McGill) and orange (Bonaventure). You will also be able to get to the Montréal-Trudeau Airport, Technoparc Montréal on the South Shore and the West Island. Different cars. REM trains are not commuter trains; their cars are more like metro cars from a technological standpoint. REM cars are smaller but will run much more frequently, which explains the significant increase in capacity. The space will be designed for smooth passenger flow at transfer station entrances and exits (poles, bars, wider spaces). Cars will be heated, air conditioned and connected to the wi-fi. Equipped stations. REM stations will be enclosed, covered, climate controlled and sheltered from the elements. You will wait for the REM on a platform separated from the tracks by an automated screen door system (it will no longer be possible to drop objects on or to cross the track; safety and reliability will thus be improved). All stations will have elevators and be accessible to persons with reduced mobility. 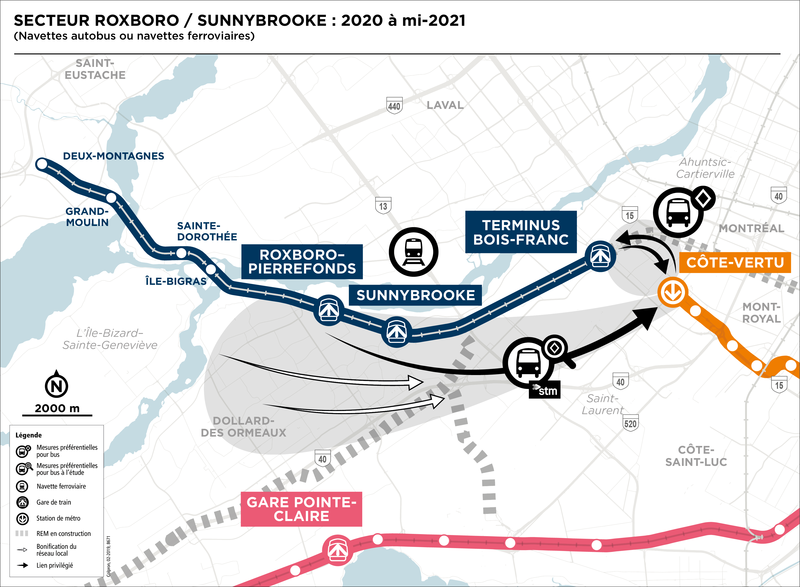 How will users be able to transfer to the Mascouche Line, once the REM is running? Once aboard the REM, allow 6 minutes to Édouard-Montpetit (blue line), 9 minutes to McGill (green line), 10 minutes to Bonaventure-Gare Centrale (orange line) and 15 minutes to Montréal-Trudeau airport. Why replace a working train system with new technology? The Deux-Montagnes line is the busiest in the exo train network, with 30,000 trips daily. It would have required major investment to be able to meet demand satisfactorily. The advent of the REM provided an opportunity to change the line to an automated light-rail system. Deux-Montagnes to Édouard-Montpetit: 29 min. Deux-Montagnes to McGill: 32 min. Deux-Montagnes to Central Station: 33 min. Bois-Franc to Édouard-Montpetit: 12 min. Bois-Franc to McGill: 15 min. Bois-Franc to Central Station: 16 min. Will the capacity be increased on the Deux-Montagnes line? 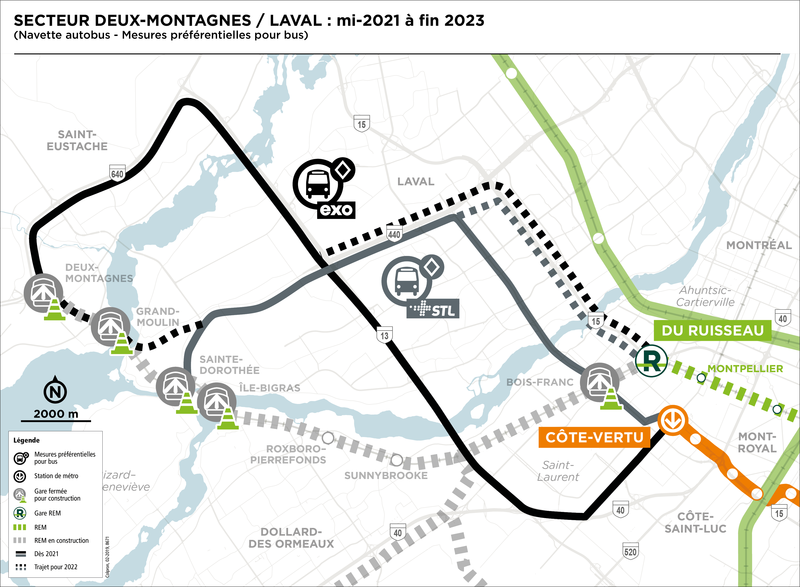 Yes, the capacity of the Deux-Montagnes line will be much higher. REM cars are smaller than MR-90 cars, but run much more frequently due to the high frequency of the light rail metro line. Thus, the REM provides a higher capacity per hour and per day. Why are there delays on the Deux-Montagnes line? There are several reasons for the recent service disruptions on the Deux-Montages line. Since June 25, 2018, REM work has required exo to operate the Deux-Montagnes and Mascouche trains on a single track on a stretch of about 3 km between Montpellier station and the Mont-Royal tunnel. A double track allows trains to pass each other and contributes to smooth operational flow. 3:35 p.m.: a passenger on train 939 heading to Deux-Montagnes collapses. 3:37 p.m.: the train has to stop on the single track. An exo inspector begins CPR to resuscitate the passenger. 3:38 p.m.: the departure of train 941 to Deux-Montagnes is delayed. 3:55 p.m.: emergency services arrive at the scene. 4:15 p.m.: emergency services leave the scene. Train 939 can resume operation after being stopped for 39 minutes. 4:50 p.m.: the departure of train 945 to Deux-Montagnes is delayed. The departures of trains 947, 949, 951, 953 and 957 to Deux-Montagnes are also delayed. Train 946 (to Gare Centrale) is cancelled. Between 3:00 p.m. and 12:30 a.m., 15 trains left Gare Centrale for Deux-Montagnes. Of these 15 departures, 8 were delayed because the times where they could pass another train on a double track train no longer matched. As a result, that day the order of train traffic had to be changed. Some trains on the Mascouche line were also affected. As well, the rail cars on the Deux-Montagnes line, the MR-90, have passed over half of their useful life and are not running optimally due to their advanced age. A mechanical and electrical upgrade of the MR-90 cars has begun. However, since the rolling stock is used to maximum capacity, the crews can only remove a limited number of cars at a time from service to perform the work. As a result, cars that need repairs must be kept in service. Equipment breakdown is one of the reasons for service disruptions. Why could the train not have been kept in service during construction work? Planning has evolved and significant constraints have been identified despite our wish to minimize impacts. Over the past few months, many meetings between the technical teams of REM, exo and NouvLR (joint venture responsible for engineering and construction) were held to examine issues arising out of maintaining traffic while construction was carried out. It became clear that at a certain point in the progress of the work, the nature of the operations would require complete closure of a section of track in order to guarantee the safety of both passengers and construction workers. How were the alternative measures decided? The transitional network is managed by the Autorité régionale de transport métropolitain (ARTM) working closely with transit companies. 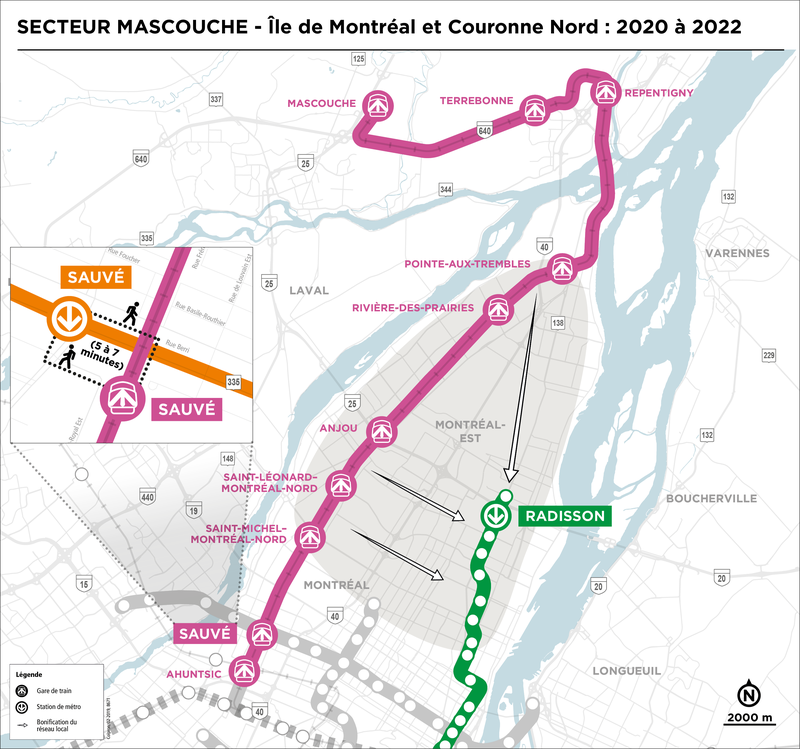 In the summer of 2018, a committee of users of the Deux-Montagnes and Mascouche lines was created by the Trajectoire Québec organization to hear users’ concerns and maintain constructive dialogue. In parallel, together with the ARTM we have organized an ideas forum bringing together 125 public transit users, mobility experts and major employers. The aim is to identify ideas that complement the public transit measures and help users save time in their daily commute. We intend to work with downtown employers on initiatives to be launched shortly.